A Little Lyrical - Mum & Wife musing about life! Today was the first time I’ve looked at my blog in a long time. I miss it. I was asking myself how it got to such a long time gap. The answer is easy. Life got in the way. Life has been tricky lately. I don’t want to say hard because that’s not the right word. I’m grateful to have a privileged life compared to so many people.There’s a warm roof over my head, warm clothes, a warm bed. I have food on the table and for all those things I am grateful. It’s just been tough. I feel like I’m spinning plates and instead of keeping them spinning, when I’m not looking they are crashing and falling. Then when I replace them a different one falls. With three children and both working full time it only takes one thing to drop and thats it, life is tricky. In the last few weeks there have been hospital stays for Roo, illnesses, migraines, a broken wrist to name a few. I feel so guilty when I can’t go to work. It’s been made worse because I’m in a new job and I’m beginning to think they will assume I’m lazy and can’t cope with everything. Why is mum guilt so bad? I’m trying really hard to sort everyone out and get them all to the right place at the right time so we can go to work. My husband is fantastic and helps lots but I still feel like its all my responsibility. I know if he reads this he’ll say its not at all but it’s just the way I feel. Sometimes I wonder if life would be easier if I gave up my job. But I love my job, I really love it and don’t want to leave. I’ve worked hard all my life to get where I am at work. I feel like I’d be failing if I just walked away. I would just like life to give us a little break for a while. I’d like normal back. A nice normal life where I can drop the babies off to school and nursery and go to work and do a great job. So please life if you’re listening give me a little bit of normal. This is a letter for you. I don’t want to muddle you all up in my head. I want a separate letter to each of you. so my darling Thomas this is for you. I don’t know how hard it is for you to be the eldest of 3. I was the eldest of two and as a girl that makes me different to you. I know that you are very clever and the things you come out with everyday astound me. I know you have a large capacity for remembering things, because you so easily recall events that my mind has lost. Sometimes I probably expect too much of you and for that I am sorry. I try everyday to remember that you are just 7. A very grown up 7 but 7 none the less. When I ask you to help (when you are actually are listening!) then you do. I know you are eager to please me and I appreciate it very much. I know too that you are sensitive and caring, and can sense when the atmosphere isn’t quite right. I love you so very much my first born gorgeous boy. I promise I’ll try and spend some time just me and you in the months to come so that you get chance to properly have conversations and express yourself. I know at home life can sometimes be very busy with lots of attention on little Roo. It won’t always be like that though. He will grow too and turn into a mini you. You are doing well at school and seem to be enjoying learning to play the cornet. I’ve noticed sometimes you find it hard to maintain friendships as you tend to lead in things and don’t always listen to everyone else. You don’t have a great imagination and are happy to watch telly or play a game or read. You very much love your brothers and sometimes it can be suffocation for them to have you kiss them, especially Too when he’s pushing you away. Maybe just a quick kiss is acceptable, you don’t have to hoover him up with love! Sometimes you don’t always think before you do things and I hope that I can steer you away from that, as it comes across as selfish. I know that if you sat down and thought first about words or actions you wouldn’t have done it. It just makes me sad when you seem selfish, so it’s something we need to work on. It broke my heart recently to hear you say that you don’t think people like you as you are odd. You’re not odd, the world needs people like you. We need people like you to teach us things, to be the clever ones. The caring ones. You’ll grow and learn that everyone is different and thats ok. Don’t ever think you don’t have any friends. You have me, I’m your vest friend and will always be here for you. As you find your way through life you can count on me if you need me. Keep living, keep learning and keep loving. Never forget I love you always and forever. If like me you have a preschooler then you’ll probably know who the Twirlywoos are! Did you know you could see them live though? MEI Theatrical are delighted to announce that the wonderful world of Twirlywoos – as seen on CBeebies – will be brought to life on stage for the first time in 2019. Toodloo, Great BigHoo, Chickedy, Chick and Peekaboo will set sail around the UK in a brand-new theatrical adventure. The show comes to The Epstein Theatre on Wed 20 – Thu 21 Feb and St Helens Theatre Royal on Sat 27 – Sun 28 April. Twirlywoos Live! is recommended for ages 1+, with babes in arms welcome. The running time is 55 minutes with no interval. Why not make the Twirlywoos Live your little one first theatre experience! To book tickets please call 0844 888 4411* or go online at www.epsteinliverpool.co.uk* or in person at The Epstein Theatre Box Office from 12pm – 6pm Monday – Saturday. Book in person at the Theatre Royal Box Office, Corporation Street, St. Helens, Merseyside WA10 1LQ (Mon–Sat 10am–5pm). Alternatively, call 01744 756 000 or log on to: www.sthelenstheatreroyal.com. Week 3 of the new year already, how is time once again evading me? As we are getting a new kitchen soon (from Ikea) there have been a few trips there ad back, in fact this week we went twice! The first time we went with my mum and had some lunch there on my day off during the week. This cheeky face loved his pasta, with peas and a side of chips! He’s also getting very funny. He is obsessed with glasses and always trying to steal Thomas’ from his face. 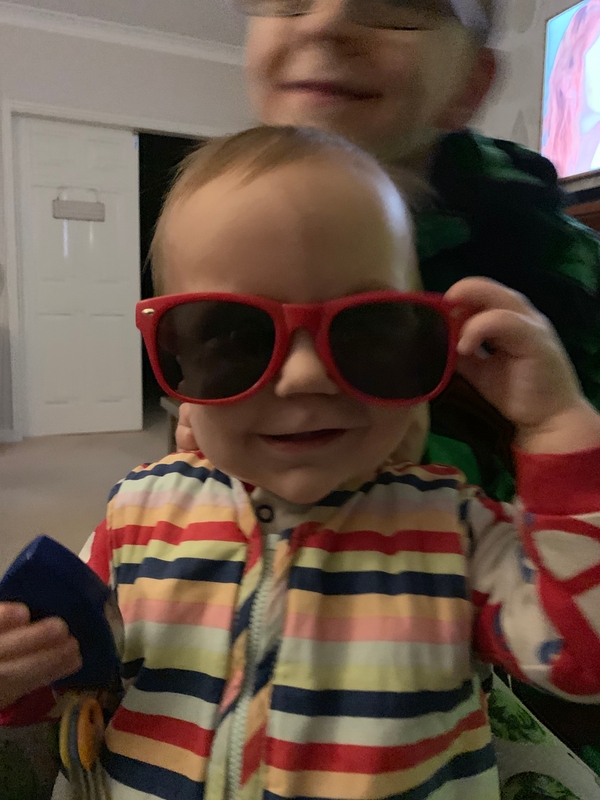 We are trying to make him stop by giving him his own sunglasses to play with. He doesn’t sleep in his own bed yet and still sleeps with me so in the evenings I tend to sit down while he falls asleep on me. Sometimes he stays awake longer because he’s not tired. On Tuesday evening this week he was awake for ages while I was watching some Walt Disney World vlogs on youtube. Every time he saw a character on the screen he would smile, wave and get excited. It was such an adorable moment to see. Capturing his innocence and excitement at seeing Mickey mouse again. By Friday though he was sickening for something and was really many and had a high temperature. Thankfully I made it through most of my work day before I got the call from nursery to go and collect him. Most of the weekend was spent cuddling him and trying to make him comfortable, he really wasn’t happy. We managed a quick trip to Ikea again on Sunday. This time for breakfast and to pick up some other things we needed. I’m trying desperately to get the garage sorted out as that’s where the kitchen will be delivered to so we need lots of extra room to store it until it starts to get fitted a few days later. Hubby took some lovely photos at breakfast and even took one of me. I’m going to share them so the boys have them in future. Thomas managed an adult size breakfast! He’s frowning up far too quickly. Felix just wanted to make a sandwich with his bacon and sausage which he enjoyed. By Sunday night to was clear poor Roo really wasn’t well, I tried to let his fever run as long as possible and it peaked at 39.9 in the evening before it broke and started coming down. A fever is the bodies way of fighting and killing off the infection so I knew it was the best thing for him. I cuddled him through it and carried on breastfeeding when he wanted it. Although he’s now suffering the after effects with a snotty nose and a cough he’s certainly much better in himself and doesn’t have a temperature anymore thankfully! Hubby ordered pizza for tea as no one wanted to cook and with Roo being poorly we just thought it was the easiest thing to do. Pizza left over was going to be Mondays tea! 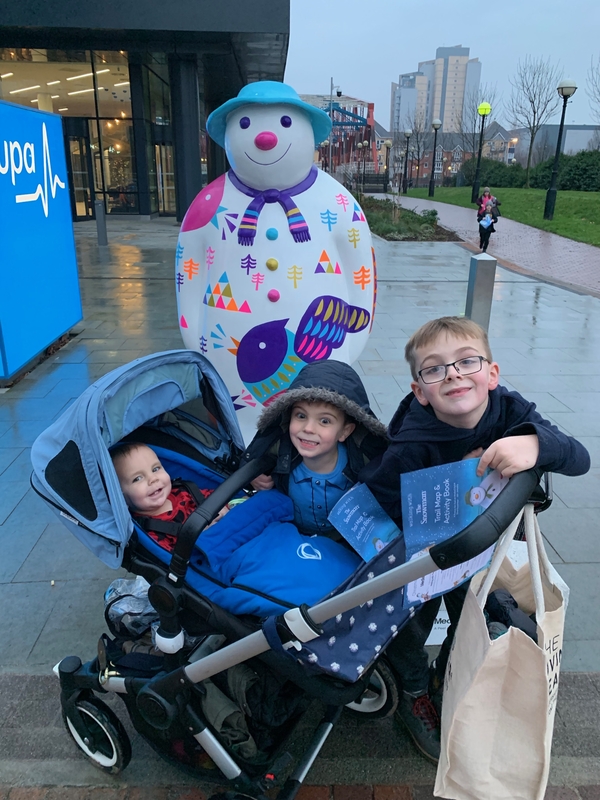 Week two of 2019 started with us going on the Snowman trail at Salford Quays, it had been on since before Christmas and last Sunday was the last day to see them. We had a great time going round to see all 12 of the guys. This past week they were auctioned off for charity and I really wanted to buy this guy no.4 so I put a bid on but it went too high so I didn’t get him. I hope he’s gone to a good home and I hope to see him again one day. Tuesday is my day off work so I took Roo out for a bit of shopping, and to get out of the house. Sometimes all day on your own with a baby is hard work so at least if we are out I can walk around. After all the marketing hype by Greggs we had to try the vegan sausage roll. I’m not vegetarian or vegan, I just don’t really like meat. I have to say I liked this. It was shared with Roo and he was equally as impressed, so it’s a thumbs up from us! I stopped by Clarks show shop too to buy his first pair of shoes. He’s been walking for a while but I’ve held off buying shoes as long as possible as he didn’t need them. However now he’s wanting to walk outside and he can’t do that without shoes. I have to say we went to Clarks as the other two got their first shoes there and both times they made a fuss, doing a little commemorative photo for them in the store. This time they didn’t seem to do that anymore so I was quite disappointed. I did obviously take my own photo but it would have been nice to have one with a special frame even if it was an emailed one or something? I also took him to get his first proper coat. With having three boys he obviously gets a lot of hand me downs but because he is a winter baby and the other two were in the summer months at age one I don’t have a suitable size coat for him so I bought him a lovely new one from TKMaxx. Friday night came around very quickly once again. Friday in our house is movie and treat night. It’s usually bath straight from after school pick up then a treat tea with a movie. I love our little end of week celebration. Thomas now goes to Beavers .This week they were making bird feeders to hang in the garden for a badge. I asked him which badge but he didn’t know? Hopefully I will get to find out! And last but not least was my Friday treat! A bottle of plum and cinnamon gin which was a Christmas gift from my lovely mummy. I wasn’t sure what it would taste like. I like the flavour of both plum and cinnamon so surely I’d like this? It was yummy! Sadly there’s not much left after Friday and Saturday night drinks!! That was our week in a nutshell. A very fast week with lots of memories made. I need entrance matting! I needed to replace the laminate! When I get bitten by the DIY bug I can’t help myself. I’m always getting crazy new DIY ideas and the house will never be finished! This time it was a new entrance mat. With three boys and a husband and the constant in and out of the pram wheels we needed something more substantial than a tiny mat. The boys always whizz past the small mat on the way to take their shoes off on the stairs. So when I saw on Pinterest that you could fit a full mat I couldn’t help but put it on my list of things to do. Measure the area and get the right size of carpet to go in the space, of course you want to order a little overage to allow for a lovely snug fit. I tried to do a time-lapse of the whole project but the camera cut out for some of it so I have had to do a commentary on top of the footage I did get to show you the project. I’ve posted a Sunday photo for a while and as it’s the first Sunday of the new year I thought I’d start as I mean to go on…lets hope I remember each week! For week one of the year I couldn’t choose just one without putting a little context behind it. My middle baby is like my shadow, he wants to be where I am, do what I’m doing and help me all the time. Sometimes I want to just get the job done quickly so struggle to let him help. But I need to stop myself from saying no and just say yes more often. He won’t be little that long and despite it slowing me down I need to let him be with me and help when he wants to. So here he is and my Sunday photo helping me clean the Christmas windows away. I love this guy. I know that Darren is no longer hosting the link up but I’d like to continue posting my weekly photo so I have something to look back on. No trip to Walt Disney World for us is complete without a visit to the Disney Outlet Store also known as the Disney Character Warehouse. Theres two official Disney Character Warehouse outlet shops close to Walt Disney World. One is at the Orlando International Outlets, 4969 International Dr, Orlando, FL 32819. The other one which I prefer is at Orlando Vineland Outlets, 8200 Vineland Ave #1252, Orlando, FL 32821. I’ve never been disappointed with a trip to Disney’s Character Warehouse. I don’r normally go to the outlet just for that shop, we normally visit for a bunch of the shops there. On this trip however time was tight so I just nipped there in an Lyft to visit just that store to see what homeware they had for our house. I’ve made a video of my Disney Character Warehouse haul, listing the sale price and how much it was origianlly on sale for at the parks. I’ve made some other vlogs of our Walt Disney World trip including our travel day and our first full day and hotel room tour. So I know it’s taken me forever but I never seem to get a moment to myself to sit down and edit the holiday videos. It was back in October 2018 that we went to our favourite place in the whole world, Walt Disney World. For this trip we stayed at Walt Disney World Beach Club Resort on the club level at Stone Harbour Club. A tour of our room can be found here. We absolutely loved it and at some point I will be adding videos of the lounge at the Stone Harbour Club. Although if you ask my 7 year old his favourite thing was the flavoured water which changed each day. He would prob now still give you a review of each one. I’ve finally finished day 2 vlog and its up on my youtube channel. If you want to see Day 1 (travel day) click here. So without further ado this is day 2! In 2018 we were lucky enough to stay at Walt Disney World Beach Club – Stone Harbour Club Level Room for 2 whole amazing weeks. Now when I was doing my research for this vacation although I found lots of info about the Walt Disney World Beach Club hotel. I didn’t find that much about the Stone Harbour Club level rooms or lounge. So whilst we were there I tried to make sure I took lots of film and pictures to share once we were back. 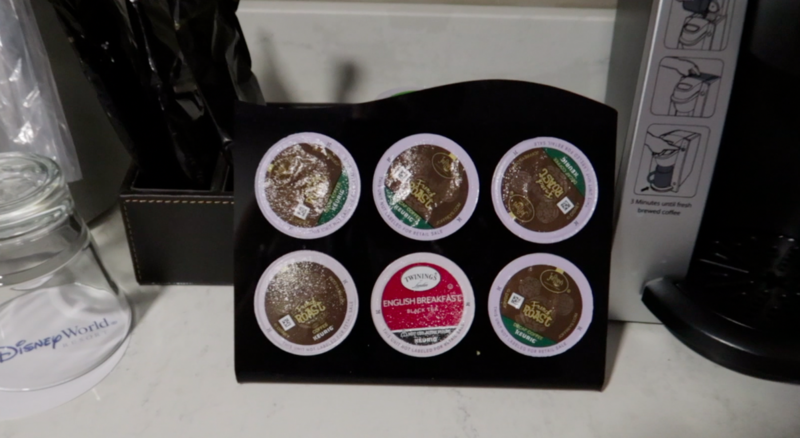 If you want to see our travel day video click here. I’m still working my way through the footage and trying to find time to edit it all. For the first one I’ve put together a room tour. We stayed in a standard studio room up on the Stone Harbour Club level. The room number was 5708. There were 5 of us, two adults, two children (7 and 4) and a baby (under 1). The Stone Harbour club level room entitled us access to the club lounge which serves refreshments throughout the day. As well as its own private concierge cast members who you can contact at anytime at their desk up until 10pm. Special shout out to Robin from the desk who made our trip magical, the boys miss her a lot! The room we stayed in had two double bed (I’m not sure what size they were as US sizing is different) so I will refer to them as doubles as they defiantly fit two people. It also had a single sleeper size sofa. It was advertised for a room suitable for 5 people and I’d say that was fair. Before we went I thought we’d be cramped in the room but actually it was ok size wise. The bathroom area had a twin sink vanity area. A large mirror and a small illuminated vanity mirror. The toilet area was separated by a lockable door and had a toilet, and small bath with shower over. The entrance area contained a fridge and coffee pod machine. There was also a wardrobe with sliding door with two robes, an iron and board. The safe was inside the wardrobe and suitcase stands. Inside the wardrobe there was also spare pillows for the bed. The television area had some surface space as well as draws and cupboards. There was a desk area with a smaller pull out table on wheels. We used the table as a dining table on the days where we ate in the room. The balcony had a view over the hotel roof, you could see the main entrance area as well as the globe at Epcot. I’ve done a video with a commentary (please forgive my boring voice!) which probably illustrates the size of the room a little better than photographs do.